Mushroomhead. . Wallpaper and background images in the Metal club tagged: mushroomhead. It's the other way around, Slipknot copied Mushroomhead. 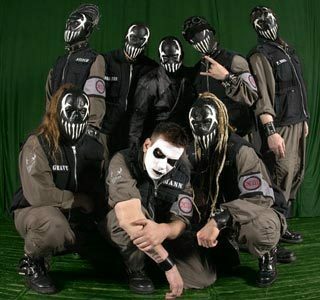 Slipknot formed 2 years after Mushroomhead. Nobody copie anyone. Two, totally diffrent bands, from two diffrent states. Who cares if they have the same amount of members, wear costumes and mask. Their both kickass bands, in my opion. And both bands, sound totally diffrent.